If Gyamtso’s latest sentence is officially confirmed and he serves the full length, he will have served a total of 41 years in prison, making him not only the longest serving known Tibetan political prisoner, but the longest-serving political prisoner anywhere, according to the Guinness Book of World Records. News of the sentence was published Wednesday on the website of the Tibetan government-in-exile, known as the Central Tibetan Administration. Some members of the Tibetan parliament called during a session in Dharamsala on Tuesday for exile Tibetan communities to prioritize Gyamtso’s case and bring it to the international stage. 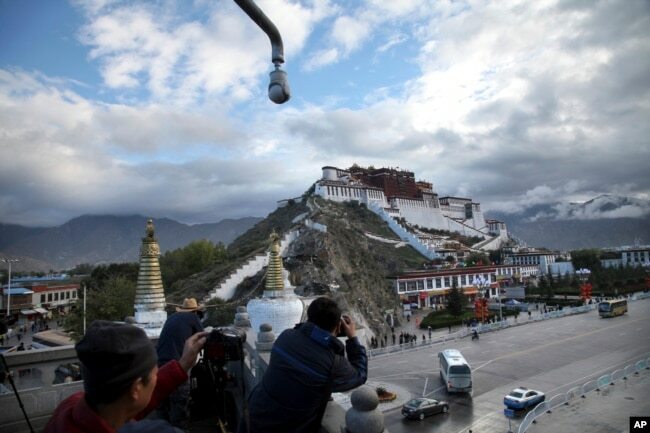 FILE – In this Sept. 19, 2015, photo, tourists take photos of the Potala Palace beneath a security camera in Lhasa, capital of the Tibet Autonomous Region of China. The Center for Tibetan Democracy and Human Rights, a Dharamsala-based human rights group, reported March 15 that Gyamtso and his wife had been “secretly” sentenced. Three members of the Tibetan parliament-in-exile said that extreme security restrictions in Sog County and the surrounding regions made it very difficult to get detailed information. Next articleDid Russia really chase a US bomber out of its airspace?